On top of a monument in Hiroshima Peace Memorial Park stands the bronze statue of a young girl, arms raised toward the sky, holding aloft a large paper crane. 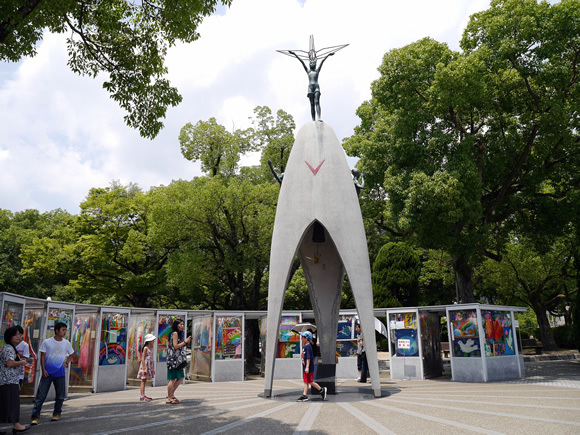 The girl’s name is Sadako Sasaki and she served as the inspiration for the Children’s Peace Monument. Sadako Sasaki died at the age of 12, ten years after the atomic bomb exploded in the sky above Hiroshima on the morning of August 6, 1945—exactly 69 years ago today. At the time, she was just two, but the radiation spewed over the city by the bomb poisoned her body and led to her leukemia in the sixth grade. Still, as Sadako’s health faded, she folded paper cranes with every scrap of paper she could find. In Japanese lore, folding a thousand paper cranes is an act that can fulfill a wish, and Sadako wished fervently to be well again. When she reached 1,000, and her health had not improved, she carried on, unbowed. Even bedridden, with paper so scarce she resorted to folding cranes no bigger than a fingernail, using a needle to make the tiny folds, Sadako persisted. She folded paper cranes until she finally no longer had the strength to make another. In all, Sadako Sasaki made nearly 1,500 paper cranes, which filled her hospital room, before passing away at 9:57 a.m. on October 25, 1955. Since that time, as Sadako’s story became more widely known, the paper crane grew into a symbol of peace. In fact, even today, chains of a thousand paper cranes are continuously sent to Hiroshima from children around the world. These colorful cranes are temporarily placed in the boxes that surround the Children’s Peace Monument, then stored elsewhere in the city. In effect, there are so many wishes for peace from the world’s children, there just isn’t enough space to hold them all. Meanwhile, the adults of the world continue to wage war and stockpile nuclear weapons. Ironically, even the groups of peace activists here in Hiroshima have had an unfortunate history of squabbling and conflict. Frankly, if there’s any hope for the human species, in terms of maturing beyond war and weaponry before we become the cause of our own demise, it lies in the innocence of our children, who still believe in hope and peace. And, in fact, children with more than one language, who may also develop greater tolerance and understanding for others, could be an important force in creating a more peaceful world. Today, as we look back and remember Sadako Sasaki and so many others who perished in Hiroshima, let’s also look toward the future and recognize that the language ability we foster in our children has the potential not only to better their own lives, but more profoundly, help better the world itself. How about you? Do you think bilingual children might have a special role to play in making the world a more peaceful place? Thank you for writing such a timely and moving post. It’s great to get this perspective as it’s not something that I’ve read much about in the press here in the UK. Jonathan, I appreciate your kind comment. While I’m afraid much of the world has largely forgotten Hiroshima—at our own peril—the atomic bombing, and the pursuit of peace that was born from the ashes, continue to lie at the heart of life in this city. Jenny, thank you for your kind comment, and for sharing this message with others. I hope you have a great school year! Previous post: Have You Failed at Raising a Bilingual Child?